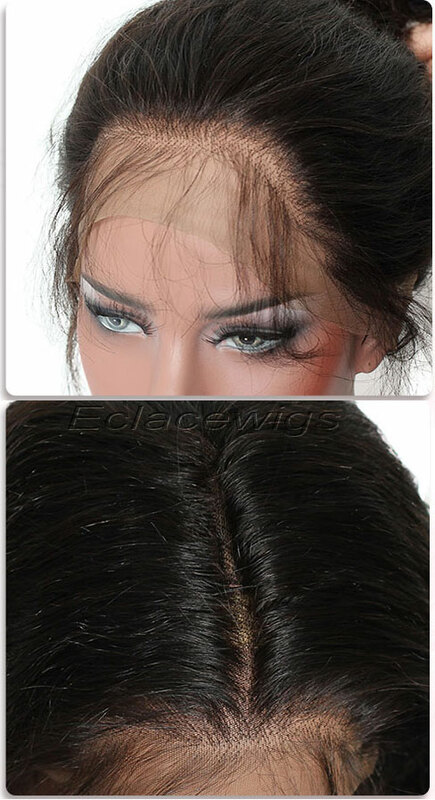 Lace wigs were designed to wear much more comfortable and natural,the mesh allow air to circulate. They also allow the wearers to personalize their looks, you can trim the hair itself into a particular style.You can also trim the hairline of the wig's lace to make it fit the user perfectly. Like most hairpieces, lace wigs are an investment piece worthy hundreds of dollars, so personalizing the lace wig should be done with precision and carefully.lace wigs means full lace wig and lace front wig commonly. Things You'll Need:Bobby pins,New scissors. 1.Secure your hair away from your face with bobby pins and make sure your actual hair is not visible when putting on the lace front wig or full lace wig. before you are looking to decide where to cut your wig,check if your hair is visible,you could make an error and over- or undercut! 2.Put your lace wig on your head in the position you wear it most often before. Take note of how much you need to trim off the front of the lace wig to match your hairline. You can either mark the area where you need to trim with a pen the same shade as the lace wig, or you can count the number of holes in the lace at one section to know the place you can start trimming hair. 3.Practice with some new scissors. New scissors will provide the most exact cut and smoothest motion. 4.Trim small amounts of the lace wig hair away from the hairline,try the wig on between each small trim. This will help you avoid trimming too much hair and lace off the edge of the lace wig when matching them to your hairline. Trim hair carefully till the wig hairline fits your natural hairline perfectly.